Lately I have been cooking and posting a lot of my comfort food recipes. Hearty soul-warming french onion soup, curry (this one and this one), creamy tapioca, lemon pudding…mmmmm. These are foods that not only keep me cozy, but also nourish my tired and warn out mind and body. They may not be the typical comfort food that most american’s have come to know and love. No mac n’ cheese. No cream o’ something soups dumped in a casserole. Sorry, no big fat cinnamon rolls are coming out of my oven (womp womp). No biscuits and gravy piled on my plate. Although, there are a few times that I miss some of those items, I feel better feeding myself and my family cozy winter comfort foods that are wholesome, full of nutrients to keep our immune systems up, and not laden with preservatives or packed with empty calories. Lately I’ve been on a polenta kick. Erhmergerd. It’s creamy. It’s sensational. It can be cheesy. It can be buttery. Hellooooo! And all it is is slow cooked stoneground cornmeal, water, and salt. You can add butter (yes) and cheese (OH YA) as options to kick it into winter overdrive. You will need to spend a bit of time upfront cooking the polenta, like 40 minutes. But you can swirl it, let it bubble away, then put a lid on the dang pot while it boils away (stirring every 10 minutes) and then it’s done. The great thing about polenta is that any leftovers can be reheated with a little liquid to return to its creamy holiness OR it can be cut and baked into awesome polenta cutlets. 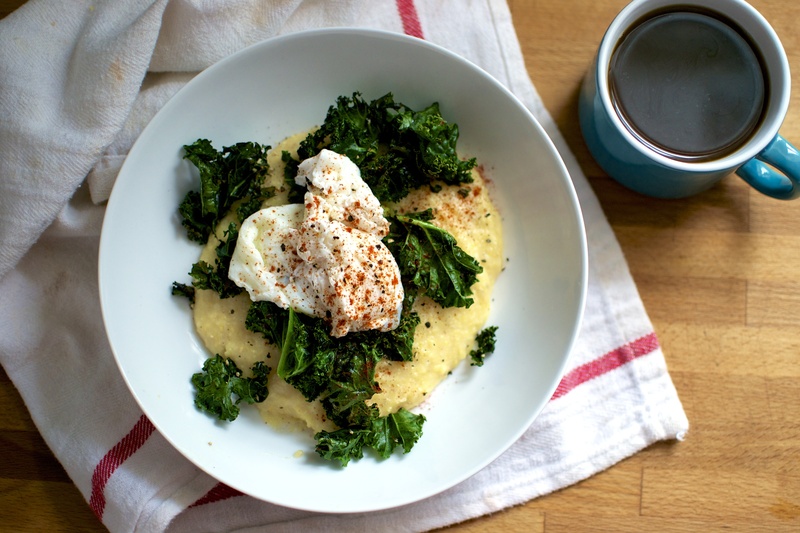 Polenta can be topped with a myriad of things: braised short ribs, sautéed mushrooms, or, my fave, a poached egg with braised kale. This dish is perfect for both brunch or dinner. Bonus, make it for brunch one day, and leftovers can be reheated for dinner the next day. Win Win! Notes: For a great tutorial on easy poached eggs, check this out. Place water in a heavy saucepan over medium-high heat and bring to a vigorous boil. Add salt and stir. While wishing the water gently, pour the cornmeal into the boiling water in a steady stream. Turn the heat down to low and continue to whisk the cornmeal/polenta until it has thickened. Cover the pot and continue to cook for 30 to 40 minutes, stirring vigorously every 10 minutes. Once it is finished, stir in butter and cheese. Place lid on pot and let sit for up to 10 to 15 minutes until ready to use. While cooking the polenta, place a separate sauté pan over medium heat. Add 1 tablespoon of olive oil. Add the kale and season with salt and pepper. Stir the kale lightly until it is slightly wilted. Stir in the vinegar, cover the pan, and turn the heat to high. Cook the kale over high heat until it is tender (about 5 minutes). Turn the heat off and set aside. Poach or fry eggs according to desired consistency. For a great poached egg, follow these directions. 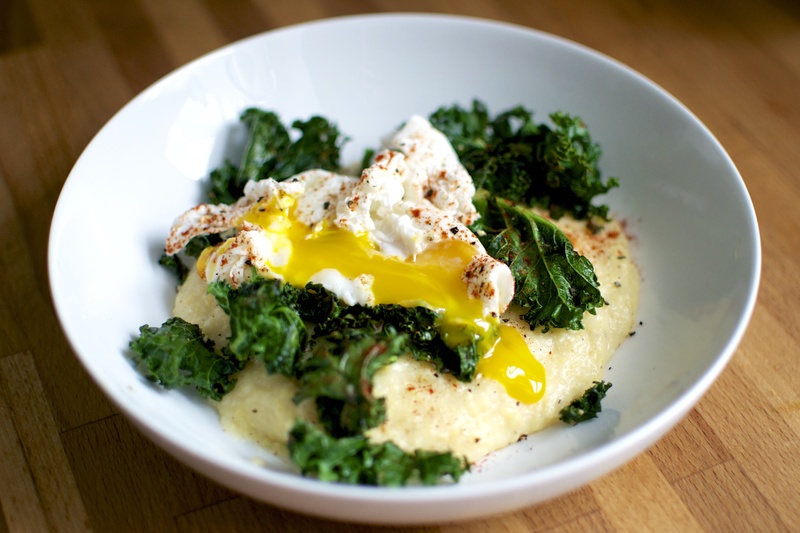 To serve, place 1/3 to 1/2 cup of creamy polenta in bottom of bowl, top with braised kale, and one poached egg. Season with salt and pepper to taste. Thank you! It’s such a great and comforting meal. Hope you love it. This looks INCREDIBLE! 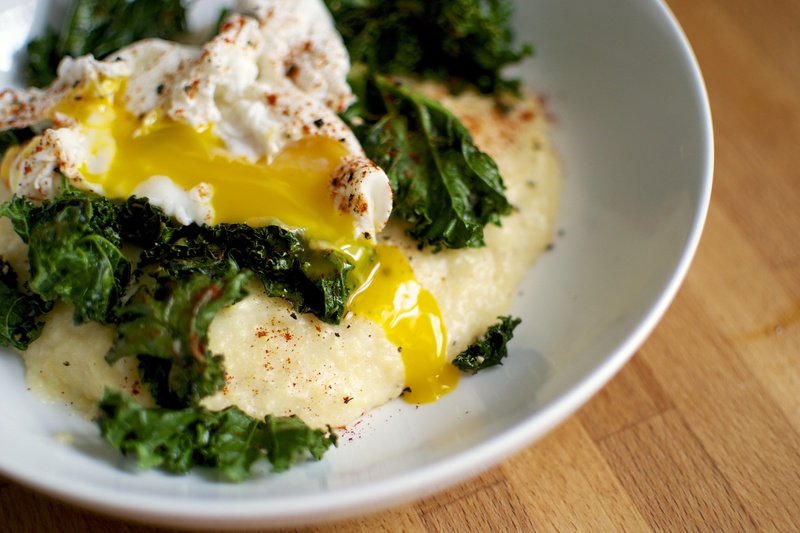 I see the seared polenta and egg on the Sqirl menu and I can’t get enough of it! I love that the polenta looks like a mini delicious polenta patty 😛 yum!